Greenfield's readings of these novels are uniformly excellent, and her arguments regarding the importance of maternity in the period and the ideological range of maternal representation are compelling. The rise of the novel and of the ideal nuclear family was no mere coincidence, argues Susan C. Greenfield in this fascinating look at the construction of modern maternity. Many historians maintain that the eighteenth century witnessed the idealization of the caring, loving mother. Here Greenfield charts how the newly emerging novels of the period, in their increasing feminization, responded to and helped shape that image, often infusing it with more nuance and flexibility. By the end of the eighteenth century, she notes, novels by women about missing mothers and their suffering daughters abounded. Even as the political implications of the novels vary, the books uniformly insist on the tenacity of the mother-daughter bond despite the mother's absence. Exploring the historically contingent assumptions about maternal care that informed writers during this period, Greenfield argues that women's novels helped construct the story of mother love and loss that psychoanalysis would soon inherit. Susan C. Greenfield is an associate professor of English at Fordham University. 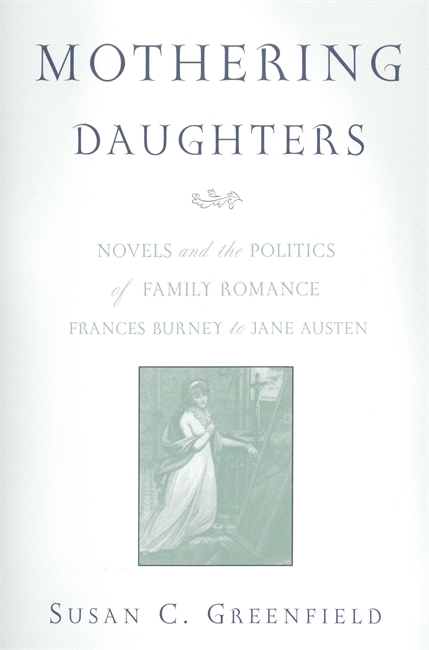 Susan Greenfield's Mothering Daughters: Novels and the Politics of Family Romance from Frances Burney to Jane Austen is a smart, well-written, psychoanalytic reading of late-eighteenth-century British novels by women. Greenfield's readings of these novels are uniformly excellent, and her arguments regarding the importance of maternity in the period and the ideological range of maternal representation are compelling." Susan Greenfield offers illuminating interpretations of Evelina, The Italian, Wrongs of Woman, Belinda, Adeline Mowbray, and Emma...Underpinning Greenfield's compelling analysis is a wealth of careful research. Her three approaches-historical, literary, and psychoanalytic-will appeal to scholars in a variety of disciplines.